The Ashante people are among the most famous metal workers in African art. 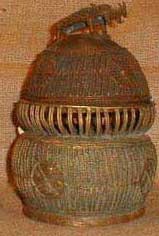 Small cast brass vessels known as kuduo were made as far back as the 14th century, and used in funerals or simply to hold valuables. This modern Ashanti metal craft.